a cheat sheet of the twelve disciples’ names and biographical details. – Free Losers Like Us Cheat Sheet on the twelve disciples (see below). Where sold: As listed on the David C Cook ebooks page, the book is available via Amazon, Barnes and Noble, BookShout!, Christianbook.com, Google Play, iBooks, Kobo, and Vyrso. As listed on GoodReads, it’s also available via Abe Books, Alibris, Book Depository, IndieBound, Indigo, and Powell’s. Check other online booksellers too. 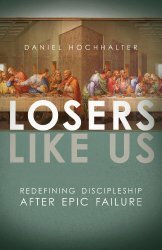 Download our free Losers Like Us Study Guide for group or individual study. Enjoy! And please contact me to let me know if the study questions helped you. Host a group study of Losers Like Us and wrap it up with a party! Check out these Party Pack sample pages; then contact me to request the whole thing. Use this handy 2-page guide to keep the disciples straight. Contacted you on facebook through message. Thanks again for writing what most of us would not have the Spiritual maturity to do! Thank you so much for letting me know! If there is anything else I can do to help, feel free to contact me. And please keep me updated on how it is going! I would love to hear more.